---http://www.unmuseum.org/archaeol.htm with an excellent diagram of an archaeological site and comprehensive discussion of the general topic. Suitable for middle and high school audiences and a MUST READ for teachers! 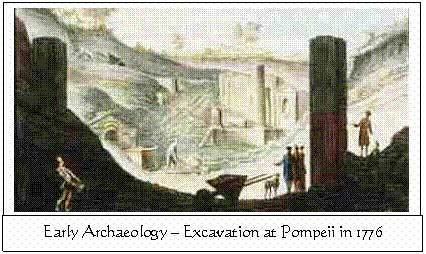 ---www.digonsite.com with WONDERFUL links to archaeology sites designed for children. In particular check out "Dead Romans" (http://www.deadromans.com/) and follow the link to the coin pages. There you will find comprehensive information on ancient coins which provides essentials in a manner very manageable for students. Excavation at Caesarea Maritima, a city founded by King Herod in 22-10 B.C. WONDERFUL for students and teachers-lots of photos of archaeology in progress! Although the text of this summary is best suited for teachers and high school audiences, all students could appreciate a walk-through of the stages of excavation. NOVA also has a documentary about Zeugma, a Roman town in Turkey, which is mostly underwater because of a modern dam. Check out http://www.pbs.org/wgbh/nova/zeugma/tools.html for a description of advanced technological methods employed today, such as geographic information systems (GIS), geophysical diffraction, ground penetrating radar, imaging radar and many others. Also read the interview at http://www.pbs.org/wgbh/nova/zeugma/salvage.html for a discussion of the dilemma between preserving ancient archaeological sites and the needs of modern development. 1. GRID: Once most excavation sites have been chosen, archaeologists mark the area with a grid pattern using stakes and strings, and also establish a depth marker. Each object found by archaeologists gets recorded according to its coordinates on the grid and its depth below the surface. Photographs and sketches are made of the objects and also of the square in which the object was located. This documentation of context allows archaeologists to analyze how the object may have been used and its relationship to objects found near it. 2. DATING: Generally speaking, if a site has been inhabited for a long time, the deepest items have been buried the longest and hence are the oldest! Certain items such as written records, coins (because of technology, style and information minted on the coin), pottery (because of technique, shape, and style of decoration), and charcoal (due to carbon dating) can often be DATED. Then, other less definite artifacts can be dated by their association with those. STRATIGRAPHY and BALKS: As a civilization continues inhabiting an area over time, levels of building and soil composition form layers called strata. As archaeologists dig, the layering becomes evident because of changes in soil color or texture, or types of materials found there. A BALK is a section of dirt which is left standing between trenches. Objects can then be identified by the stratum and studied in context of other artifacts dating from the same level of inhabitation. Dig in Israel-photos and drawing of a balk showing clear layers of stratigraphy left as a guide for archaeologists, then a helpful diagram of buildings found at various layers. 4. TERMINUS POST QUEM: This is a Latin phrase referring to the date of the LATEST object found in a stratum. Although a stratum may contain objects spanning many different time periods, the date of the stratum can never be earlier than its most recent object! This sounds complicated to students at first, but let them think about this: A thousand years from now, an archaeologist digs up a house in America which has a coin dated to 2004 C.E.. Also in the house are many antiques inherited from grandparents and great grandparents. Although these objects predate the coin, the contents of the house must have been in use at least as late as 2004.
assess the condition of the artifact and to document it with photographs, drawings, descriptions, and sometimes more specialized procedures as an x-ray. determine the appropriate techniques to stabilize the artifact if needed. This may involve a chemical that keeps the artifact from disintegrating or epoxy to strengthen the object's walls and prevent collapse. clean the artifact with brushes, small tools, or chemicals to remove deposits. perhaps RESTORE or RECONSTRUCT the artifact. http://www.bbc.co.uk/schools/romans/activities/index.shtml Click on the image with "Problem Pots" A simple activity to help students with the idea of restoring a pot. 6. RESTORATION: the process of bringing the object back to its original appearance. To do this an archaeologist uses clues from other artifacts from the same culture and time period and also close observation of the fragmentary remains, sometimes by means of a microscope or x-ray machine. Since restoration requires applying non-original materials and risks alteration or damage to primary resources, archaeologists often choose NOT to restore, but to leave the artifact in its authentic condition. If they choose restoration, applied materials are sometimes painted a slightly different hue or given a slightly different texture so that it is clear to an observer which part of the artifact is genuine. Attempts at restoration have sometimes involved processes which ruined the ancient artifact over time. An alternative to restoration is RECONSTRUCTION. 7. RECONSTRUCTION: Reconstruction involves making a modern COPY of the artifact. This allows other to appreciate the entire object without altering ancient evidence. The Minoan Palace in Knossos, Crete is an example of a heavily reconstructed site. Sir Arthur Evans, the archaeologist at Knossos has often been criticized for his choice to reconstruct rather than simply restore. 8. 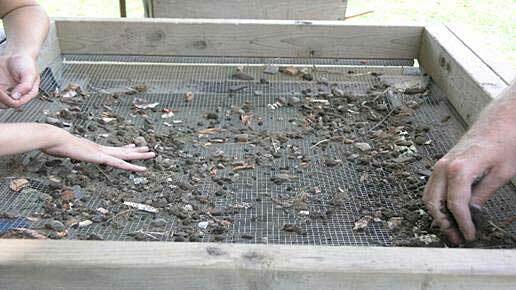 SIEVING: After larger objects have been removed from soil, samples of the dirt get fine-sieved. Archaeologists may fill vessels of excavated dirt with water and stir. The items which float are called FLOT and include lighter materials such as seeds, grain, pits, nut shells, and charcoal. The wet soil continues to get sifted through increasingly fine sieves and the contents gleaned at each stage are dried, labeled, and studied. This process brings to light tiny particles such as seeds, small animal bones, beads, tiny pieces of glass and metal,etc. 9. PALEOETHNOBOTANY: This is a rather recent dimension of archaeology and involves the analysis of plant remains which humans used or cultivated in ancient times. In addition to clues about diet, this study provides clues to agricultural methods and trade, environment, economics, and ecology. It is interesting, for example, to discover whether the plant remains derive from crops which were native to the region. At Herculaneum, the cavities made in ash and lava from Mt. Vesuvius' eruption have not only informed archaeologists about species of plants, but also the exact layout arrangement of Roman gardens! 10. SPOIL HEAP: After close examination and fine sieving, soil gets placed into the "spoil heap."